Many customers find that a good medium support pillow is the difference between 8 hours sleep and tossing and turning through the night. The Pillow Factory ® 50% Feather 50% Down Encompass pillow is an excellent medium weight, medium support pillow which ensures that you will sleep soundly tonight. 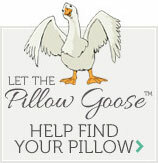 The Pillow Factory ® 50% Feather 50% Down Encompass achieves this by using strong grey goose feather and down which more supportive than white goose down which tends to make pillows softer. That is not to say that The Pillow Factory ® 50% Feather 50% Down Encompass is all support, the 50% down used gives excellent cushion and loft that you would expect from a down/feather pillow. The Pillow Factory ® 50% Feather 50% Down Encompass can also be found in some very fine hotels where customers demand dependable beds and comfortable pillows. Give yourself the best chance at a good nights rest by choosing The Pillow Factory ® 50% Feather 50% Down Encompass and see why the staff of DownPillows.com recommends this pillow before any other line!